In this project, we’re building a simple 150 watt amplifier circuit. This is the cheapest 150 Watt amplifier circuit you can make,I think.Based on two Darlington power transistors TIP 142 and TIP 147 ,this circuit can deliver a blasting 150 W Rms to a 4 Ohm speaker.Enough for you to get rocked? ;then try out this. TIP 147 and 142 are complementary Darlington pair transistors which can handle 5 A current and 100V ,famous for their ruggedness. Here two BC 558 transistors Q5 and Q4 are wired as pre amplifier and TIP 142 ,TIP 147 together with TIP41Â (Q1,Q2,Q3) is used for driving the speaker.This circuit is designed so rugged that this can be assembled even on a perf board or even by pin to pin soldering.The circuit can be powered from a +/-45V, 5AÂ dual power supply.You must try this circuit.Its working great! The preamplifier section of this circuit is based around Q4 and Q5 which forms a differential amplifier. The use of a differential amplifier in the input stage reduces noise and also provides a means for applying negative feedback. Thus overall performance of the amplifier is improved. Input signal is applied to the base of Q5 through the DC decoupling capacitor C2. Feedback voltage is applied to the base of Q4 from the junction of 0.33 ohm resistors through the 22K resistor. A complementary Class AB push-pull stage is built around the transistors Q1 and Q2 for driving the loud speaker. Diodes D1 and D2 biases the complementary pair and ensures Class AB operation. Transistor Q3 drives the push-pull pair and its base is directly coupled to the collector of Q5. PCB’s for this project can be ordered through PCBWay. We shall upload a sample PCB file (for download) shortly. Remember TIP 142 and 147 are Darlington pairsÂ .They are shown as conventional transistors in figure for ease.So don’t get confused.Even though each of them have 2 transistors ,2 resistors and 1 diode inside ,only three pins ,base emitter and collector are coming out.Rest are connected internally.So its quite OK to assume each of them as transistor for ease. All electrolytic capacitors must be rated at least 50volts. Power supply for this circuit. AÂ +40/-40 unregulated dual supply for powering this amplifier project is shown below.Â This power supply is only enough for powering one channel and for stereo applications double the current ratings ofÂ the transformer, diodes and fuses. Note:- We have explained how to create a schematic of this circuit and its PCB using an online EDA tool – EasyEDA.Â You may read the article to understand how to draw and develop a PCB of this circuit. 1. 2 X 60 Watts Stereo Amplifier Circuit – is designed using LM4780, an audio amplifier IC that can deliver 60 Watt RMS output power per channel toÂ 8 Ohms speakers.Â Advantages of using this IC are low harmonic distortion compared to other IC amplifiers of similar category and a power supply rejection rate of 85db. In addition it require minimum components and a built in mute function. 2. Headphone Amplifier Circuit – This is a simple circuit which uses only 3 transistors, that can be used to drive your headphone. It can be easily built by any one and can be powered using a 3 volts battery. 3. Mosfet Amplifier Circuit – This circuit is designed using two Mosfet’s and one transistor; which makes it an easy to build circuit. It can deliver 18 Watts output power to 8 ohms speaker or 30 watts to 4 ohms speaker; you can do it the way you like it. Another advantage of this circuit is the minimal use of components. 4. 40 Watts Amplifier using TDA1514 – TDA1514 is a high performance hi – fi amplifier from Philips. It requires a dual +25/-25 volts supply. Advantages of using TDA1514 are low THD, mute standby feature, thermal protection and other features. It can deliver 40 watts of output power to an 8 ohm speaker. You need a proper heat sink for the desired reliability of this circuit. 5. 2 X 32 Watts Stereo Amplifier Circuit – This circuit is built using TDA2050 which is a 32 Watts Class AB Audio amplifier IC (monolithic) . This IC has many features like thermal shut down, low THD, short circuit protection etc. This circuit uses Two of these IC TDA205o; one for each channel.Â An 18 volts dual power supply is required to power this circuit. Hello sir i have a concern with the output because when the volume is in the maximum level it will distort or creates noise. I use 15-0-15V and 6ampere transformer. please help me sir. Please tell be the minimum and the maximum volage range of this circuit. What type of transistors can i use except tip’s?? With pleasure may I tell that the circuit diagram of 150 watt amplifier is very good to read. The “Stereo Amp” will be identical with “Mono Amp” circuit. Anyway before the assembling, powering and connecting the exact specified load to the system,the sound quality will tell me pleasant and nice. Sir instead of publishing only the circuit diagram,kindly provide the stereo amplifier PCB, the power supply board along with the transformer specifications say the data for winding with gauge of the insulated copper wire for primary number of turns as well as for secondary reminding of ampere, the core size and lamination’s brand etc. Sir I am very much interested in assembling of stereo sound systems with high output in RMS ratio. If you provide me here above items,very frankly indicate, I don”t mind about the cost at all. I am not real knowledgeable on SS…I do have an Ampeg B3158 bass guitar combo. This amp uses TIP 142 and 147’s in it’s power output circuit. My question is can these pwr transistors develop lower output volume but still function or they like a diode….it works or doesn’t? I ask because when I first got the amp I didn’t have to turn the gain and master up as much as I do lately. You can replace tip142 with 2SD718 and tip147 with 2SB688. If yes, is tip41 left unchanged or replaced? I want to make 5.1channel150 watt amplifier. post more information about that, and plz upload the amplifier circuit diagrams of speakers and sub woofer. can i use 10” 80watt subwoofer for this amplifire . Sir I have made that circuit on vero board.All continuity and connections are double checked found OK.But when I give signal input from PC or mobile no audio output is available at speaker.Please help me and guide me sir what should I do.Im using 24-0-24 Transformer and instead to Diodes Bridge combination I am using a Packed Bridge rectifier.Dc out put is Â±30.Please please please help me and guide me sir. 142 n Tip 147.Boundles of output power.I check the sound quality of this amp. is excellent. i use 12 v auto head lite bulb(upper-dipper both filaments) instead of 0.33ohms/7w resistances. i know this is a little old. how will this perform as a guitar amplifier? im assuming this will work fine but is there anything i should know? Noise is removed by replacing 220ohms resistor with 550 ohms resistor. It will adjust the gain of amplifier so noise will be removed. i make this circuit and i buy all components but if i already built this 150wRMS Amp nothing SOUND i hear . You can use this amplifier as a guitar amplifier because is a class AB. It means there are a pre-amplifier in the circuit. I hope have answered your question. can you please tell me about its major applications? I build this and it sounds good. but when i increasing volume, R10 become very hot and get burned. please help sir. No, you canÂ´t. 1N4007 is 1A, 1N4148 is 200mA high speed diode. Fig.1 Simplified outline (SOD27; DO-35) and symbol. The diodes are type branded. 1. Device mounted on an FR4 printed circuit-board; lead length 10 mm. Is it advantageous to use a constant current source instead of R6? The aim is to emulate an infinite impedance theoretically increasing the common mode rejection ratio to infinity? To avoid using positive feedback in the output stage is it beneficial to add two more transistors connected in such a way that the Darlington’s would be made of three cascaded transistors instead of the usual two. I did some reseach and what I learnt so far corroborates my impression that this circuit is well designed and worthy of a try. Thanks for taking the patience to reply. I am interested in building this amplifier but am finding difficulty accepting the differential input should be driven between -45V and +45V. I also think, using PNP transistors for a differential input is quite uncommon today. 1) To meet my criteria I changed parts of the circuit so that the differential input is made of NPN transistors instead that are connected between 0V (common, ground) and the +45V. 2) The output stage has also been modified so that R3 and R5 are on the negative side of the supply (-45V). I moved the driver transistor Q3 to the other side, that is, the +45V making sure to keep the same resistor values. Naturally, Q3 has been replaced by a PNP transistor. 3) In the input stage, differential input, the signal ground has been made the same as that of the differential input stage. I am attempting to build the amplifier with my modifications. i finished this amplifier and the sound seems very clear but very low comparing to a 100w …i get like 8 or 10w at max ….for a speaker of 80w 8ohm i used a supply of +-45 5A and 2 of 0.22ohms 5w and a pairs of MN2488 MP1620 instead of the tip142/147 and for the rest i used the same as the shema and no picofards for modifications … any suggestions plizzz ? Hey guys have you already tried the PCB design of this schematic by jspayne? but there are just some modifications recommended to improve the amplifier’s performance, i think it is good. you can search it in google. Try this 300W Hi-Fi mosfet AmplifierÂ http://adf.ly/vNFeo. The sound is superb. http://adf.ly/vLIxB link of 100 watt subwoofer amplifier PCB layout comes from Sir Seetharaman. Install Pad toPad software to open PCB file. Thank you sir for the PCB layout God Bless. 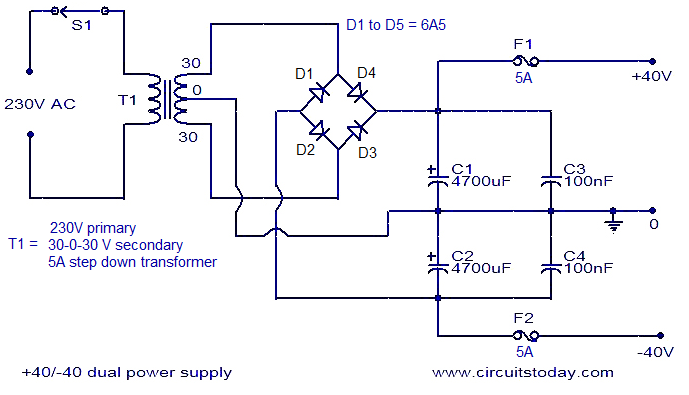 for stereo can i double this circuit and use a 5A transformer is it enough. If i use 2SD2390/ 2SB1560 can i power this from 56-0-56V and what will be the output power? Using TIP142/ TIP147 and power it from 56-0-56V all of the sudden the emitter and collector of output transistor got shorted. can i power this 150w amplifier from a 25-0-25 transformer.how much watts will be the output if i charge it from 25-0-25 8ohm speaker. please find the link below, will it works and give 400w output.which is the better circuit 150w circuit in this page or the circuit in the link bellow.please help me to choose one. Sebin I’m powering mine with only 11-0-11 8ohm speaker. If you give 45-0-45 it gives 150w. For 400w you need another circuit. Hi is -45V 0 +45V 3A is enough to supply for stereo? Thank you. sir, can I have your pcb diagram for this circuit? Thank you very much. I’m using 4700uf caps as shown in schematic. In one of the comments Seetharaman you said 10000uf for filter!! are these the right caps so? Problem solved. Added more capacitors to 9000uf. It is okay to supply 56-0-56V in this circuit? Matti003 it seems that you have a short somewhere if the lines are burning. Try to add a fuse atleast the fuse burns until you find the problem. Sir can i use MJL21193-MJL21194 instead Tip142-Tip147? if i use MJL21193-MJL21194 what is the max. supply voltage? 100% working Stereo complete PCB layout of this amplifier including power supply on the single board is available along with all the building instructions and online skype support only for 5 US dollars. Hello Guys , i have a complete PCB layout as well as circuit diagram of this great circuit in stereo form along with the power supply on the single PCB board. hi omer, is it for free, then i would be glad if you can provide me with what you have regarding this project. Hi. Can i have one? Can i check it using Multisim? what if i want to modify this cicuit. i want a 15 watt output.. what should i do? You can not obtain 15 watts from this specific amplifier. For 15watts you must go for tda2030 circuit. Sir i again try it. But a proble is that, After 5 minute when play music the power transistors are damageing. I dont know what is the actual problem. I am using 27 0 27 volt 5 amp (+-35volt) transformer and 8ohm woofr. I also check the diodes it is working perfect. I use a wire loop between the base of 2 power transisters but no responce. I think that it is the problem of voltge. Please help me sir……. Now cold check all components check the wiring thoroughly. Check your heat sink size. By shorting output transistor base is not having any response your driver transistor may be defective. Add 100PF ceramic disc capacitor between collector and base of Q3. Check whether the supply leads are quite short and decoupled properly. hm sir I have tried this board but the place of speaker output is supplying voltage – , what should I do ? try fixing jumper wire between Q1 and Q2 base and switch on and try. if output transistors are getting heated up and only the sound is very much distorted check both the diodes. circuit diagram shows 8 ohm driver of 150 watt and description says 4 ohm. Please clarify. Thank you sir. Hello..I have plans to build a good sub-woofer. Can I use the same circuit for the same? Can some one point me to the PCB, sub-woofer box measurements? I believe now a days SMPS power supply’s available, can SMPS supply used to power this amp? Any guidance will be greatly appreciated. BTW, I am from Bangalore, anyone know what is the best place to buy these components? How many inch speaker i can use????? in place of 0.33, 7 watt resistance can i use any other watt and value? Finally i did it. Its working great what a sound providing this amp. I really thank to seetharaman sir . God bless u. Sir i did this. But when i connect supply a noise is producing like “buuuu”. I think that my circut is perfect becouse i chek it somany times using the diagram. I dont know what happent. I use +/-32volt 5amp dual power supply and 4ohm 10inch speker and 0.5 ohm 10w instad of 0.33. When i connect supply, tip142 , 147 and 0.5ohm 10w become very hot. Now i waste somuch money to build this amp. I dont know what happent? I think that it is problem of tip transistors. Please give me a suggestion to overcome this sir, please…….. If any problem when i connect 4ohm load with 27 0 27 v ac supplay? Is Tip transistors bloom ? Can i use 0.5ohm 10w resister insted of 0.33ohm? I rebuilt the circuit on a breadboard with tip142, tip41c and four quarter watt 3K3 for a one-watt configuration. I test it with two computer power supplies (+12, 0, -12). TIP41C (no heat sink attached) feels cold, TIP142 and TIP147 along with the two 0.33 ohm 7 W resistors are HOT. The speaker goes half way to the negative direction and stays there with no sound coming out. Where should I check for pre-amplified signal and where should I check for drive signal from TIP41C ? PS: The PSUs are not exactly 12 volts unloaded, one is ~10.5 v and the other is ~11.3 v, both can supply 8 amperes safely on the 12 v rail. I have a (+45, 0, -45) unregulated power-supply, should I test with it or solve the issue at 12 V first ? 4.AND USE 680PF 100 VOLTS ON POWER TRANSISTORS BASE TO COLLECTOR. Hi,i am a Ryan, i have gone through this article here,what i wanna know is you said here, ” SPEAKERS SHOULD BE GOOD QUALITY AT LEAST 12â€³ 100-150WATT HANDLING CAPACITY” but i wanna know what should be the Impedance? 8ohms 150w or 4ohms 150w? I have a BPL cwx 59 model which has a Amp section made of TDA 2050 & i am gonna upgrade that for my mixing purpose,for the Lower end 20Hz-100Hz. I am geting confused as the pre amp has a section of 5band +/- 10db Graphic eq of 100,400,1k,4k & 12khz also with a bass boost,so if i boost the 100Hz with the Bass boost ‘ON’ that point of time the Speaker need a more wattage as well as the Amp…so what would be the proper wattage of the Speaker to use i am getting confused. Hence A little help would be appricated. 2> If i boost 100Hzs 10 db that raises all the frequencies 100 below,now with that if i make bass boost on (which is boosting from inbetween 70-80Hz & below, so what would be the wattage of the speaker? actually this amp delivers actual wattage of 150watts on 4ohms speakers, and 100 watts on 8 ohms. TDA2050 IS 30 WATT IC,SO THE SPEAKER WILL NOT WORK. USE GOOD QUALITY SPEAKERS ,YOU ASKED ABOUT FREQUENCY ,IT DOES NOT MATTERS JUST FIX IT UP ON ANY AUDIBLE POINT , I HVE USED THIS CIRCUIT IN 2006,SINCE THAN IT IS WORKING AMAZINGLY.I HAVE USED 30.0.30/ 10AMP TRANSFORMER FOR SUPPLY FOR 150+150 WATT. NOTE: THOSE PEOPLE WHO DO NOT HAVE HEAVY WATT SPEAKERS USE LOW CURRENT SUPPLY ,BUT THE VOLTAGE SHOULD BE SAME. YOU CAN USE 30.0.30/5 AMP SUPPLY FOR BOTH THE CHANNELS, IT WILL PROVDE YOU THE SAME QUALITY SOUND ,BUT THE WATTAGE WILL BE HALF NEARLY 80+80 WATTS. hi, this is Jagan , we are in the need of designing 150dB amplifier with speaker. please suggest me a way. how to achieve it. Currently we have designed amplifier with 125dB using LM3886. What are your expectation. Hope your budget will not be constraint, if so project can be suggested. Sir, I built the circuit but I’m having problems, C2, C3 and R2 blowed up twice. I checked the traces for shorts but I found none. All capacitors are rated 50 V, R2 is rated 1/4 W. I’m using a 45 V dual supply. The TIP141 gets warm, TIP41C reflects wind like sound in the speaker, TIP147 is cool and on power up, the speaker cone moves forward and keeps it’s position until power is removed. Please help ! Check TIP147 collector-emitter must have become dead short check all your wiring and polarity of capacitors, if they are interchanged( plus- minus polarity of the capacitor) it becomes a link wire instead of an DC isolator. A thorough check is required including D1 & D2. Sir please give me a solution to solve ma problem. I have +/-40v 5amp supply. I made this amp. I using 4ohm subwofr. How can do to connect my woofr on my amp to get good perfomence. Is there any circut for connecting 4ohm load into 8ohm amp to get good perfomance? Please help…. Connect one more 4ohms woofer in series. You can measure the milli volt drop across R8 and set it for say you are using 0.47 ohms then 0.47 * 0.06A = 30 to 40 milli volt and set for this value. If you cannot measure milli volt accurately. Use current measurement in the collector circuit of Q1. Break collector of Q1 to positive supply line and insert an ammeter and set the current for 50 to 80 mA. Hello, I can’t seem to find the TIP142, so I ordered TIP131f, is it ok ? I’m making a subwoofer amp by the way . Being a TO220 casing transistor it may get heated up and may blow. Use only TIP142 for better thermal stability as it has a better casing TO247. You may have to reduce the power output to <100watts with TIP131. I’m very sorry sir,I miss spelled that. I meant: Can I replace the TIP142 with a TIP141 ? Also, is this: http://ram-e-shop.com/oscmax/catalog/product_info.php?products_id=1175 heat sink good enough, one for each transistor and a fan to force air on them ? By the way, it has fins. Also, I can’t find the 3.3 K in 1 W packages, any solutions ? Hi, ive built this amp but it seems that the bass response is too high. What can i do to lower the bass response, maybe decrease the gain? You can reduce the gain by increasing the value of 220 ohms of R2 to 470 ohms or 1K. That should take care. 1: 40-0-40 VOLTS TO 42-0-42 VOLTS 8 AMPERE DC POWER SUPPLY,THAN USE 12″ 4-8 OHM SPEAKER POWER HANDLING UPTO 150WATTS. 2:IF YOU ARE USING 40-0-40 VOLTS TO 42-0-42 VOLTS 5 AMPERE DC POWER SUPPLY FOR BOTH THE CHANNELS THAN USE 12″ 4-8 OHM SPEAKER POWER HANDLING UPTO 100-150 WATTS. 4: HEAT SINK SHOULD BE PROPER,I HAVE USED 3″*3″HEAT SINK WITH FINS/OR BAR FOR TIP41,AND 4″*6″* WITH FINS FOR TIP 142,TIP 147. Thanks for your guide line. This will help others to take care and successfully construct the amplifier without any doubt and safely investing their money on the project. Thank you once again. Hello Sir, where/how should i connect the add’tl 680pf capacitor in tip142/147? across base-collector or base-emitter? Sir what should be the heat sink size?and is it safe to use 4ohm woofer with +-40v supply? Yes I have the original Universal Pre amplifier appeared in 1972 Philips Application book. I will send soon. sir i have also observe that using 2N3773 TR,is gives more loud and low frequency in compare to 2SC5200 TR,,I tried many circuit. 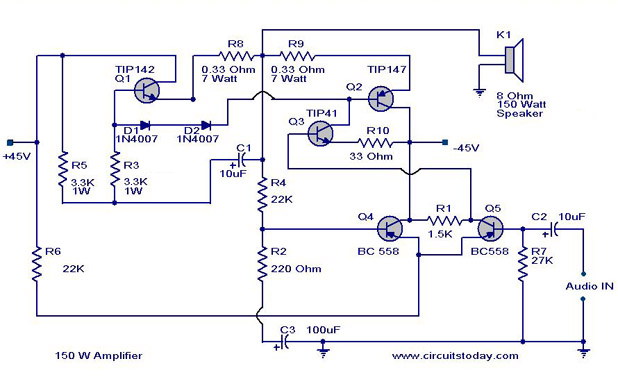 so please suggest me ,even your subwoofer circuit made by 2n3773 is gives good low freq. I am using preamp of philips amp made by mr. M.D hall,and it is giving terrific sound,with almost every amp,i have used it with more than 20 amps,gives terrific sound..
Hello sir, I can’t seem to find the 0.33 ohm resistor in my country due to it’s high power rating and I don’t wany to order it online as it would be too costly, can I ommit it or replace it by a self made wire wound which I won’t know it’s power rating, or can you suggest other solutions ? Thank you in advance, regards, Youssef Aly. Hi Aly you may get 1 ohm 2 watts which is a standard value, use 3nos in parallel to get 0.33 ohms 6 watts. 1.i have made many circuits from net,from efy and other books i have tried 47 diff.circuits but i have seen only one good circuit which is made by philips company based on the book of M.D HULL,THIS delvers 25/40 watt RMS output by 0-60volts, TR BD139,140 AND BD 182,and delever you good sound even you do not have good speakers . Hello that is the same circuit of Philips (from Philips 1972 Audio Application Book)I modified and used it in my Motional Feed Back Amplifier. In fact I have used 2 amplifiers in bridged mode to get around 150 watts into 8 ohms speaker. In the revision 2 of JSpyne the gain feed back circuit was changed to reduce the amplifier gain to R4 / R2 22K / 1K only 22 hence you require higher drive, comparing to original circuit. You can improve the gain by reducing R2 to 220 ohms. a gain of 100. 5 times better. It is customary to keep the gain around 50 in the output amplifier (for better frequency bandwidth)and increase the input through pre-amplifier to achieve the same output. 1. The specification says 150W in 4 ohm, do you know how much it will deliver in to a 8 ohm load? 2. What size heatsink would you recommend? 3. The transistors TIP 142 / Tip 147, would you recommend them in TO-247 or TO-220 housing? (the problem is tip 41 is linked with heat-sink now i disconnect the link the problem is solved. now it works fine thanks a lot.!! sir I can’t figure out wats wrong with my amp after building it I tought it will work fine,but instead I’m only having a very little sound @ d output . pls help me sir. D one I made the first time worked fine. N I couldn’t get 3.3k @ 1watt so I used a 2.7k n a 750ohms resistors in series. Wen I read d value across d two resistor with my dmm it showed me 3.35k pls sir suggest me on wat to do.could it b dat my resistor combination led to d@ problem? No. you resistance combination is ok. Check C1, C2, C3, R2 and R4 for correct value or a defective component. sir how many voltge we can apply on its input . Mostly transistors might have blown. Use cold check with a multimeter to find out damaged components. check the wiring and component values and polarity of each component used. use 33 ohms 10 watts resistance in positive and negative supply rail before switching on again after thoroughly inspecting the assembly again. If any one of 33 ohms smokes switch off immediately and look for the mistakes and correct it. Still if you cannot solve the problem kindly contact a local friend who is well versed in assembling high power amplifiers to help you. If this is the first time you are assembling a high power amplifier it is better take an advice from a local professional in assembling and proceed. place mica sheet between tip142&tip147&tip41 and heatsink.check out and confirm there is no link between heatsink and those transistors. Hi sir !! i bought another transformer for stereo…. now the dc voltage is +60/-60 and 0(GND) after bridge rectifier. can i use this volt. or need any changes to this amplifier ckt?? Looks like a poor quality transformer with bad regulation A 5amp transformer of 30-0-30 cannot give plus minus 60 volts it can give only plus minus 45 volts at the maximum. Kindly use series regulators and reduce the voltage to around plus minus 40 and use. for 60 volt plus minus this amplifier will get burnt you may have to replace all the semiconductors and capacitors with higher voltage rating, which are very expensive. No. The regulator will help keep the voltage around the correct level required. The current depends on the regulator capacity. to increase you can use additional transistors. You can use the following technique. Place a wire link between Q1 and Q2 base and energize and see if not getting heated up. It looks there is a problem in 1N4007 diodes. If it is still getting heated up check TIP147 for collector emitter short. Are using 18 SWG or better DC power connecting cables and are they less than 2inches. While switching what sound you are getting from speakers. May be D1 & D2 are wired other way round that is anode/cathode inter changed. Check collector emitter and base of TIP142 & 147 for correctness. Check the healthiness of TIP147. How much DC you are feeding to amplifier. What is the speaker impedance. What about the input to the amplifier whether connected to ground or left open. Have you taken care of short length of DC power supply cable should be less than 2 inches. Check all the wiring and your layout and DC supply do not exceed plus minus 35 volts DC. Please give more details to give a solution. Sir,the transformer shown in the power supply has a 30-0-30 output,can you explain how it get increased to 40-0-40 V at o/p after filtering. I am building a 5.1 amp,i have a 30V 6A single supply transformer for powering the 5 channels(2xTDA 2050+3xTDA 2030),after filtering the tranformer with a 4700mf capacitor how much voltage l get as o/pâ€¦?? If you use 320 volt RMS AC voltage transformer the DC output will be peak of RMS voltage after rectifying and filtering. THAT is 30 X 1.414 = 42 volt s DC. you will get +42 0 -42 volts DC. you will get 42 volts TDA2030 will get damaged it requires a maximum of 36 volts for 4 ohms load speaker. use only 24 volts transformer. for TDA2050 it is ok as 44volt dc is max allowed. What is the minimum voltage required for run this amp? Minimum is + – 30Volts DC and Maximum is + – 45 volts DC with the components indicated. with + – 30 volts DC you will get 85 watts into 4 ohms load and 42 watts into 8 ohms load. with 45 volts 100watts into 8 ohms load 4 ohms load not recommended, will damage output transistors instantly. Sir what is the minimum voltage for this amp? i m also want to build 5.1 using this circuit. i build stereo but this is not successful for stereo………….. but for mono this gives very good output. if u find any solution for 5.1 plz share here..thank you!!! sir thanks again for another reply!! i build this darlington for left right. And for subwoofer i use TDA7294 ic (100watts rms). and i use stk 4141 for center and rears. But there is a problem with this left right channels. both channels inputs are comes out through both left and right channels. this is only my problem. i use unregulated +44/-44 and GND power supply for all these amps from single transformer.is this problem? i think this is the problem. thanks again!! ok sir … i ll try again …. and i ll show you that amp. thanks again!! you can use the standard 0.47 or 0.5 ohms 10 watts which are available readily in the market. If space is not at premium in your amplifier enclosure you can use 2nos 0.33 ohms 2 watt in series and connect in parallel with another 2nos 0.33 ohms in series to achieve 0.33 ohms 8 watts finally. Choice is yours. Can i use a rectifier ic for 6a5 diode in the power supply circut? Yes you can use 6A5 it is 6Amps 500v PIV rectifier. Please use any circuit which uses dual supply(both plus and minus voltage with zero volt reference)To get +12 volt use 7812 12 volt 3 pin regulator ic, for positive supply and to get -12volt use a 7912, a 3pin negative voltage regulator ic. Sir i want to builda a subwofr filter using my +35/-35v 5amp dual power supplay . I saw a filter circut on this site using +12/-12 dual power supply. Please give me a solution to convert 35v to 12v. Iam waiting for ur replay. Please sir .. I have +35v/-35v 5amp duel power supply. If i connect my supply to the power amp, how much power will get 10inch 4ohm load. Please clear my doubt sir. I’m hoping your replay, have a good day. sir can i place one capacitor loop with one resistor from the positive pin of speaker to ground for my mingle problem? if i place it what happens? AND i use this as subwoofer amp. gives GOOD output . BUT. . . . one major problem that is the input of both chanells are amplifying through both channells. . that mean the input of 1st channel is amplifying through both channel. . AND also 2nd channell input also amplifying through both channels. . BUT no dissorted audio. CLEAR output. PLZ give some solutions for this . . THANK you sir!! i use independent circuit of output transistor pin short protection for each channels. and also completely i trace out the circuit for any mistakes. there is nothing to problem. except the ground(0volt) is common.i think this is the problem. because both speakers are looped with common ground volt. this may short with the other end of the output of each channels. but i cant understand this problem.bcoz of my poor knowledge. FINALLY I REALIZE THAT THERE IS NO WAY FOR STEREO FROM ONE TRANSFORMER. SEPARATE TRANSFORMER IS THE ONLY RIGHT SOLUTION. Thank you sir, god bless you. i use this circut as a subwoofr amp. If i use 25 volt 5amp ac with 10inch 4ohm subwofr what power actually get? You have to use 25 – 0 – 25 volt @ 5 AmpAC transformer with bridge rectifier and filter capacitors to get both +ve and -ve power supply required for the amplifier. please refer to the power supply circuit given in 100watts sub woofer amplifier. plz help sir! i finished one channel. it works perfectly. but i made another channel for stereo. here the problem that the first channel input amplifying through both channels. and the second channel input is dead. (no audio) and also the heat is abnormal. what is the solution for this problem.plz help. If you are using single power supply for both the channels disconnect first good amplifier connect the one getting heated up by putting a link between Q1 and Q2 base the current through output transistors should fall and the if audio input is supplied it should sound distorted. If it is not achievable check the complete wiring and for a defective component, isolate replace and rectify. i use dual power supply. i found the problem with power supply. that is i gave the supply for both channels from one tranformer. (this is the problem) AND i need solution for power supply for 5.1 using this circuits from only one transformer(sec=24-0-24). IS THIS POSSIBLE ??. If it is possible i m very lucky. THANK you for your response sir. Ensure each amplifier circuit is isolated by a diode and 1000uF in parallel with 0.1uF ceramic disc capacitor for both positive and negative supply. ok i ll try sir, and thanks again!! Good evening Sir can you please help me!I m new in electronics I can’t find tip142, tip147, tip41 Can I use other power transistor instead of these tips I like to making electronic kit. And I also want a perfect amp circuit diagram in one channel with parts list include watt which produce 200watt with deep bass. I m waiting for your answer. Thank in advance. can i use a 4ohm speaker instead of 8ohm ,which is written in the first figure?or i need some modifications? Hi, i wanted to ask, can this circuit be used with an antenna rather than a speaker??? Hi… Seetharaman sir i have question for you sir..
i need to know that what is the problem exactly ? Please what if the fuse is removed can it affect the working of the circuit. My question is that what is the work of the fuse. Please i need reply urgently Thanks for reading. By deleting fuse your protection to the amplifier is lost in the event of speaker leads are (amplifier output) shorted both the output darlington transistors will blow off. You can test the transistor with a multimeter in diode test mode. being darlington transistor forward continuity of base emitter junction will be 1.2V and Base collector will be 0.6. collector emitter in reverse bias will be 0.6 due to built in protection diode (see internal details shown above)and forward continuity will be open circuit. Hi Andrew go to the following site modifications indicated to be implemented for stable reception. http://pcb.jspayne.com/150wattamp.html first circuit is good enough. if you have layout problems then use second circuit. To enhance output can I use BDW83C & BDW84C in lieu of TIP 147/TIP142 or any other MOSFET? Kindly suggest. After changing Transistor how should I combine two sets (left & Right Channel) of amplifier to produce enhanced output. Kindly draw a diagram. How much supply DC votls and Amperes need for Single pair and combined pair? I have a couple of 32-0-32 volts @ 4Amp and 40-0-40 volts @ 5Amp trafos lying around at home. So I thought of building an amp which can use them. Any schematics for something like this? I haven’t searched on the net, maybe there are some amps out there. In terms of audio quality, the most important thing is CLEAN and BALANCED sound. We need to hear the little things! I was thinking to build a set of mono block amplifiers, not too fancy but nice enough for my Dynaudio Audience 42W speakers. Can someone help me point out some amplifier designs? Think I can handle a build completely from scratch. So what is a wise decision? I estimate, with these supplies you should get around 150 watts. Im not sure whats wrong with my circut because if i mesure the pins where is speaker output i got 37V,and tip41c get really hot but the other two are cold (Im testing without speaker and MP3 only power supply). I hope you could help me with solving the problem. Thank you. I would like to drive an 11 ohm speaker from this 150 watt amplifier. I only require a 105 watt output. Using TIP142GOSND and TIP147GOSND both rated for 100v@10amps, I estimate the supply would require around +/- 90vdc. The circuit appears to be able to handle the load if I use all components rated for the increase supply voltage. Do you recommend and changes to the original design? or have any suggestions to drive the 11 ohm load? Seetharaman, i cant find 6A5 diode. But i have 6A10 DIODE can i use it, or will the current be too high? Hi Rex you can use 6A5 is 6amps 500PIV rectifier. 6A10 is 6 Amps 1000vols PIV rectifier. both are suited for the project. Request indicate the best circuit for public address system amplifier. with use of 18 inch horn. Seetharaman, i want to make the POWER SUPPLY CIRCUIT but i cant find 6A5 doide. Please i need other Doides for replacements. We have built this circuit about more than 1000 times this works well and perfect..
hi seetharman, i switched on the power supply and the tip 142 heated up very first and eventually the volume of the speaker deminished,the tip 142 cooled and i again switched on the power supply but there was no heat as if the tip 142 was dead. even there was no sign of heating in tip 41 and tip 147 are they dead.i also want to know how i can get some results of the amplifier using the signal generator and the CRO coz i tried and there was no change in the output from the CRO with respect to the input signal ie there was no amplification effect, how can i get this. Hi Moses you can increase the supply voltage to + / – 36volts DC (the upper safe limit with 4 ohms speaker). Hi mr seetharman thanks alot for guiding me up to this point the circuit is working but i used +/-22.5V to power the amplifier and the output was low,i also noticed that the TIPs are not heating as expected,i used a DVD as my audio input. so my question is, could it be the low voltage that i used or my TIPs are dead? the speaker is 150watts 5ohms. This circuit works, but D1 & D2, which are supposed to provide the bias for the “A” part of the class AB description, can come from anywhere and therefore have unpredictable actual forward voltages. Garden variety 1N4007 diodes can have forward voltages ranging from 0.3V to 1V! The lower this voltage gets may result in audible crossover distortion, and the higher it is, Q1 and Q2 may conduct heavily (more A than B, at all times including no-signal conditions), become very hot and die if not properly heatsinked! It would probably matter little if this was a lower-power amplifier (<40W), but for a design that aspires to 150W, a transistor in place of D1 and D2 whose base is connected to a pot that can fine tune the bias voltage is essential, IMHO (the www is filled w circuits for this). well, i used a heat sink for TIP142, but wasn’t that big and i also placed a fun beside it which reduced the temperature to some extent, but the sound still distorts and diminishes eventually. when this happens, i turn it off for it to cool. when turn it on it takes a longer time for it to sound and the sound is even very low and noisy.i will have to turn it off and wait for a very long time, even though the tip142 is cool before it sounds. it doesn’t end there, it still over heats and the same thing happens again……Anyway,tip 147 doesn’t heat at all. it remains cold while tip 142 becomes hot. i don’t know if there is something wrong. it looks like all the work is on tip142. I will get a bigger heat sink to try and see the results. okay, thank u very much. but then i want to know, tip142 and tip 147 are darlington pair transistors with side base, but i do a diode-test of these transistors, they read as side base and they can also read as if they are center base. is that the nature of these transistors? that is how they were when i bought them from the market. Hi Daniel may be your TIP147 is dead short between collector and emitter. check with the multimeter for this and if required both TIP142 and 147 with a matched pair transistors. hi seetharman i used +-22.5V to power the amplifier and every connections seemed to be ok but when i connected to the signal generator for the input signal,the output from the CRO(CATHOD RAY OSCELOSCOP)was smaller than the input meaning there was deamplification instead.please i need also to know into details how the preamplifier and darlington pair works on my email ,could it be yhe lower voltage i used please coment.thanks regards. Hi Mr. Seetharaman, the amplifier is now working, but tip 142 becomes very hot when i power it, and the sound eventually becomes noisy and finally diminish.in any case i am using c558 instead of bc558. i don’t know if it is going to be a problem. Hi mr seetharman my capacitor C2 10mf 100V blew of when i powered it but before blowing it was not allowing the signal input to flow untill i had to shotit,please could there be any problem with this capacitor or could it be some where else, coment (these are the changes i made, i replaced 0.33ohms with 0.47ohms 5W and i used 120pf capacitor instead of 100pf and two 15-0-15 3A TRANSFORMER in series insted of 30-0-30 5A)the way you wrote to me and my power supply was +46/-46V. please go through my 11th july comment and give the results. hi mr seetharman, i powered my amplifier with -46/+46 volts power supply that i made using the 2 15-0-15 3A transformer and the 220 ohms resister got burnt so i am asking my self could it be that the resistance was too small or the watage i used and i have bought half watts instead of quarter watts please coment on this. i also want to use the signal generator and the CRO to determine some x-tics of this amplifier.please coment on this. Check polarity of C3 and also for a collector base short circuit in Q4 or there may be some wiring mistake or transistor leads identification wrong. 1/4 watt is sufficient for 220 ohms. thank u very much for the reply.i have done the modification and it can now pick the sound of the mp3 at a lower volume. but it gives a hazy sound with background noise “puf…puf” with breakage in the sound what can i do to get a clear sound? Hi Daniel you may please go through my 2nd July comment. Implement all the modifications indicated in the second circuit it should take care of all your layout problems. Seetharaman, Thank you for your response, what about 1N5408 Doide, can it replace 6A5 Doide? Hi Rex 1N5408 PIV1000 and IF is 3 Amps only. Try using 2 nos in Parallel. Hello, Can i use 1N4007 Doides to replace 6A5 doides in the power supply circuit? Can i use 1N4007 Doide to replace 6A5 doide in the power supply circuit? Hi Moses you can use 2nos above amplifier in bridge mode to drive 800watts speaker with reasonable quality. If you can get 100 watts 4 ohms speaker use two nos in series to achieve 8 ohms 200 watts. -i have built the amp and it is working, but the sound is very bad. i also have to open my mp3 player to the maximum volume before the sound becomes stable, which is even a bad sound. what can i do about it? -also, the voltage specification of the capacitors. whenever i go to buy the components, i am challenged with the voltage, since one capacitance value can have different voltages. are there any means of detecting the voltage required? Hi Daniel check with no signal input to amplifier check the current drawn by the output darling-ton pair (by measuring their collector current) It should be between 50 to 60mA if not adjust by adding a resistance of 10 to 27 ohms and a diode IN4007 in series with D1 and D2 once this current is achieved it should work nicely. HI. I can’t find speaker of 8 ohms with 150 W. Is there any alternative? Thanks mr seetharman for your advice and am doing it but i need image of the pcb connection of both the power supply and the amplifier on my email if possible the videos of the connection.please sir i need this because i want to avoid loss of some components due to connection mistakes because we have very limited components in the market. hi good day to you mr. seetharman….my question is…how to connect in serries of two 15 0 15 3A transformer to get 30 0 30 6A?…..plz reply with this question…. Hi Moses use the full winding without center tap of 15-0-15 3amps transformer. It will be 30 Volts. Use one more transformer in the same way in series ensure it gives 60 volts end to end if not interchange one of the transformers secondary winding connection. it will be 60 volts end to end. and use the inter connection between transformer as center tap. Now your power supply of 180 watts is ready. this can easily power your amplifier one channel. do the same for other channel also. I am looking at this circuit and cannot understand how 2 X 1n4007 diodes are able to bias the output transistors (darlingtons) into conduction, surely you would need at leat 4 diodes, to bias the 4 Vbe junctions? Yet many have built it and say it works well, what am I missing? I WAS thinking of using 15-0-15 3A AND 15-0-15 2A in series coment on this sir. Hi connecting two transformers in series will increase the voltage but the current will be the same, if they are identical transformers. this is the basic. Please conduct the experiments and give a feed back by using different complex combination of transformers. please check your mail. thanks mr seetharman for u reply but there is one thing confUsing me about the transformer coz last time u told me to use 2nos 15-0-15 3A transformer and connect in series and it will give 30-0-30 6A my question is what about the TIP 142 AND 147 transistors which requires maximum current of 5A, WONT THEY OVER HEAT WHEN I USE THOSE TRANSFORMERS IN SERIES SINCE THEY WILL PRODUCE 6A. Thanks alot Mr seetharman for your reply coz you have given me another hope of coming out with what the project requires and i think i need to know how you are coming out with some of this calculations of like the output power, input signal and the output voltage of the power supply.may be on my email;alelem@rocketmail.com, good day sir. sir, i was able to get 0.47 5W resistor that you told me about except that i couldnt find the 15-0-15 5A transformer and am going to use 15-0-15 3A TRANSFORMER and i will try to measure the output voltage.what do you suggest about the fuse coz am still using the 5A fuse and am going to use the 6A10 diodes in the bridge but am not going to change other components in the power supply appart from what i have stated above.i hope i shall go to the amplifier after the power supply.thanks alot mr seetharman for your wonderfull work i have already learnt alot even before finishing the project.meet tomorrow. Hi Moses you can use 2nos 15-0-15 3amp transformer in series to get 30-0-30 6 amps. with the above power supply and 4 ohms speaker you will get 150 watts output with 8 ohms speaker around 100 watts out put power with an input of 300 milli volt rms signal. so i could just slap 5 9volts on this bad boy just to see if the circuit works aye? Thanks alot mr seetharman.i tried looking for the 15-0-15 5A transformer but i didnt find it in the all of our city but instead i found 15-10-15 3A transformer and our laboratory technician advised me to use it and determine what it will give at the output of the power supply and my question is what will be the output voltage of the power supply if i use 15-0-15 3A TRANSFORMER, what will be the output of the amplifier,and what should be the magnitude of the audio input,will there be any adjustment in the other components like the bridge rectifier and other components in the amplifier.thanks your respond will be appreciated sir and i hope i will learn alot from this project. am going to look for 15-0-15 5A transformer but can i use 6A10 diodes in the rectifier circuit instead of 6A5 thanks.what other alternatives are there for 0.33 ohms 7W resistor coz i dont have them in our electronics shops. If you can get 15-0-15 volt 5 amp transformer can be used as voltage doubler circuit to feed +40 & -40 volts to amplifier. You can use the dual supply indicated in the following link. That can be adopted for any voltage. Interesting concept. Can you tell me where is it mainly useful? I mean in which cases we can frequently use this? i wanted to put this circuit into another use.please help me about this and may be how to connect it for another use. Hi Moses please give for what use, then we can suggest. MY DVD PLAYER HAS SUBWOOFER OUTPUT, SO IS A SUBWOOFER FILTER NECESSARY? helow. good to u sir. this kind of circuit amplifier, will it work in astereo circuit?? Plz sir if you have a 12 audio stereo amplifire circuit then plz give me..